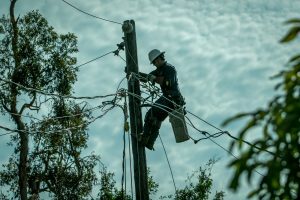 While hundreds of thousands of Floridians raced to evacuate their homes in anticipation of Hurricane Irma, more than 100 members of IBEW Local 1245, including PG&E line crews, operators and field support staff, headed directly into the path of the storm. 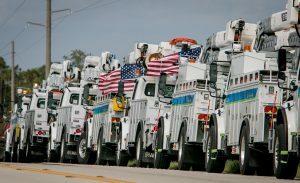 Knowing that Irma would likely knock out power for millions of Florida residents, these members selflessly volunteered to be part of the relief effort, which was facilitated through a mutual aid agreement that PG&E and Florida Power & Light (FPL) signed in 2014. “It looked like there would be a lot of devastation, and I knew I could be a helping hand, so when the opportunity arose, I was all for it,” said Nick Smith, a GC lineman who works out of Bakersfield. For two weeks, the members worked tirelessly –16 hours a day, with just eight hours between shifts, and no days off — to bring the power back on as quickly as possible. On Sept 8, as evacuation orders were being imposed in counties all across Florida, the team from PG&E boarded a plane to the “Sunshine State,” intent on arriving before the storm hit so that they could jump into action as quickly as possible. 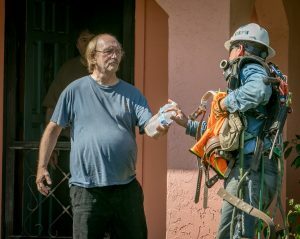 Most PG&E line crews are accustomed to challenging work conditions and rough terrain, but what they encountered in Florida was well outside the realm of what they’re used to. The gale force winds from the hurricane took out much of Florida’s jungle-like vegetation, making many areas practically impassible. The sandy terrain, combined with standing water, meant that the crews had to use sophisticated air compressors in order to dig holes for utility poles. The swampy weather and extreme humidity, which at points soared above 90%, resulted in PPE that was completely soaked with sweat in just a matter of hours, and the storm had deposited so much water that in some places, it went up past the tops of members’ boots. 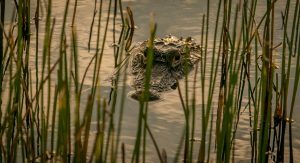 Additionally, toxic vegetation and wild animals — including poisonous snakes, spiders, fire ants, massive mosquitoes, crabs and crocodiles – could be lurking anywhere, which added another level of excitement to the work. Despite the innumerable hurdles, the PG&E crews quickly surpassed FPL’s expectations in terms of productivity. After an initial round of patrolling, the Local 1245 members were given the go-ahead to commence restoration. There’s no question that the customers were exceptionally grateful when they saw the line crews in their neighborhood. Many would come up to them just to express their gratitude, or ask if there was anything they could do to help. People lined up to do the linemen’s laundry so that they would have clean clothes for work. One resident with a golf cart offered Smith and his tools a half-mile ride back to the pole he was working on. The crews were frequently offered beverages, popsicles and snacks from thankful residents. In one instance, Barber’s team was treated to a delicious lunch by a local caterer who had a bunch of food that was going to go bad, and decided that the crew deserved something special that day. “We felt the appreciation and the love big-time from the people of Florida,” said Barber. The relief effort wasn’t limited to just those working on the ground. In the aftermath of the storm, FPL’s call centers were confronted with extremely high call volume, so a team of about 30 Customer Service Representatives in Sacramento provided additional support remotely by fielding some of those emergency calls and outage reports that were coming in to FPL’s customer service lines. According to PG&E, this was the first time that the company partnered with another utility to provide call center support during a natural disaster. 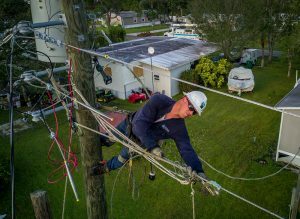 “Technology is making it possible for our members, working in their own center, to provide direct support to FPL as they work tirelessly to restore power to millions of customers. Service is their profession, and we are proud to answer the call of duty,” said IBEW Local 1245 Business Manager Tom Dalzell. Thanks in large part to all of the help FPL received from Local 1245 members, as well as other linemen who came in from all over the country, power was restored for the vast majority of customers far more quickly than anticipated. According to news reports, as many as 6.7 million homes were without power immediately after Irma, but by the time the PG&E crews returned home on Sept 23, that figure had dropped to less than 75,000.